You're IT The Skillful Shopper Antiques! 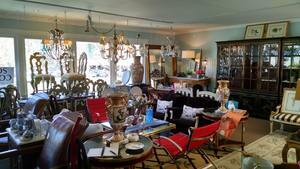 Three questions with Christine Utter, Proprietor at The Skillful Shopper Antiques. I started my business for many reasons! I will not go into all of the reasons for lack of space on this page, so I will tell you the main reason: I'm passionate about all things beautifully crafted and the thrill of the hunt! I wish I could explain to the world the importance of buying second hand. Just the emissions alone is helping your home not emit toxins -- Antiques are Going Green on steroids! So GO GREEN and buy antiques. Buying anything second-hand helps the earth and the quality of the craftsmanship is SO - So much better! My best selling product(s) and service are customer care! We love what we do and it shows. We love our customers :). We offer unique products that you will not see in your neighbor's home. We pride ourselves on not being a conveyor belt of inventory. We are a unique fun place to shop. We offer free consultations for one piece or an entire estate. One of our great services is running well organized, well advertised and gainful estate sales!